A familiar sight on Beacon Hill. Photo by Helen Cook via Creative Commons. Though it’s a bit distant from the Hill, the Part 150 Noise Study Open House on Saturday may be of interest to the many Beaconians who are irritated by noise from the overhead flight path in and out of Sea-Tac Airport. The open house is the fourth in a series of public events related to the Part 150 Study, which is looking at ways to reduce aircraft noise impacts on communities around Sea-Tac Airport. The open house will be held on Saturday, April 9 at Sea-Tac Airport’s Arrivals Hall, between 10 a.m. and 4 p.m. The Arrivals Hall is at the south end of the main terminal, baggage claim level. From Beacon Hill, an easy way to get there is to take Link to the Airport Station. If you drive instead, park at the south end of the airport garage, on floors 5 through 8, near the yellow or green elevators, rows N through U. Take the elevator to floor 4 of the garage and walk across skybridge 1 to the main terminal. Look for signs directing you to the Arrivals Hall, next to baggage claim carousel 1. Parking will be validated. Being a retired military and airline pilot, I was always curious at the reluctance to discuss a profile descent as used landing to the West at LA International (LAX) that keeps the traffic high until it intercepts the glide slope, well above residents in the surrounding area. This works and it cuts the fuel costs to airlines rather than diving to get as low as possible (even on clear days) and driving in low at high power settings with flaps and gear thrown out well outside the outer or inner markers–dumb. The other curiousity is the equally vexation at not implementing a serious noise abatement takeoff procedure such as in place at John Wayne international Airport (SNA)? I guess the property values and income of Beacon Hill neighborhood get the same attention and treatment as the million $ homes there. Sad to see as those two solutions would provide a lot of relief for a lot of people. But I guess that isn’t the culture of the Port of Seattle, they do it their way…;0)…and we pay the tab. Steve!! Appreciate your input, but we need your voice at Seatac today. How else would it have been accomplished at LAX and SNA than via motivated residents, property owners, and other interested parties beating down the bureaucracy? Beacon Hill needs you! As a Boeing engineer, I agree with you that it makes more sense to coast into the glide-slope. I’m optimistic about the FAA New Gen ATS initiative – development of which Seatac is actively participating. Although I don’t work on this project at Boeing, it is a move in the right direction. Since it will save them fuel, the airlines are much more likely to upgrade their fleets without the need for costly mandates. Neighbors, I encourage you to stop by Seatac today. Rather than simply complaining about noise, please state your constructive support of transitioning Seatac’s flight paths to more like what Steve is describing and what is currently used at airports like LAX and SNA. Push for the New Gen ATS! Let’s be heard! I got there a little after 3. Had some in-depth discussion with some of the reps. The focus was largely inform-the-public-how-to-tolerate-the-noise (as advertised, naturally). The folks I talked to were happy to receive my interest in Required Navigation Performance (RNP) and personally agreed it would make a big difference reducing noise to adopt higher altitude profile descent on approach. RNP would require tech upgrades to older aircraft, but I don’t see any reason why profile descent couldn’t happen because it adds no cost besides a little crew training. Unfortunately that was outside their charter and purpose, and these matters are controlled by the FAA. Sigh. I doubt my input went anywhere. @Steve Snyder: Where did you move to if I may ask? 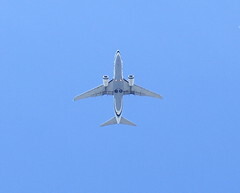 Is there anywhere in Seattle where the noise from airplanes landing or taking off is not pervasive?